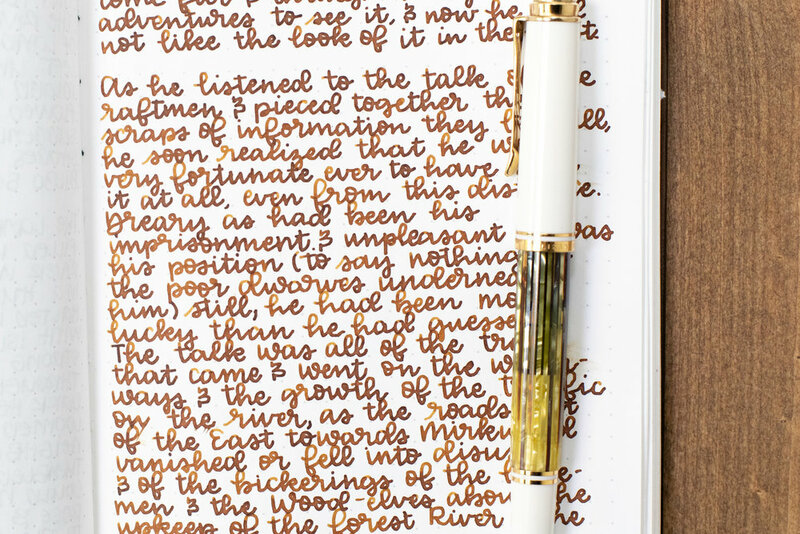 Our next Taccia ink is Golden Wheat. Thanks to Pen Chalet for sending a sample over for review. Tsuchi Golden Wheat is a gorgeous medium golden brown. In large swabs the ink looks flat and dark. Other properties: high shading, no sheen, and no shimmer. Golden Wheat is closest to Robert Oster Caffe Crema, but I really don’t have a good match. Click here to see the Taccia inks together. I used a medium Pelikan M400 White Tortoise on Tomoe River 68gsm. The ink had a wet flow. Overall, I really love the color and shading this ink has. It’s beautiful, I’m adding a full bottle to my wish list.